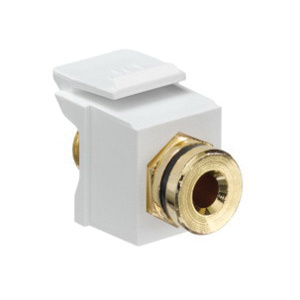 Leviton QuickPort® Banana jack QuickPort connector features high-impact fire-retardant plastic connector body. It has a dimension of 1.15-Inch x 0.58-Inch x 0.64-Inch. The connector accommodates bulkhead snap-in female to female connector. The screw terminal connector is compatible with all QuickPort wallplates, housings and panels. The connector snaps into flush- and surface-mount outlets, multimedia outlet system with adapter, Decora® inserts, patch panels, patch blocks and any other QuickPort housing. Connector is UL/cULus listed and CAN/CSA certified.